In this article we will discuss and implement persistent storage in OpenShift v3. If you are new to OpenShift v3 you should first read the OpenShift v3 Lab Configuration article to get going. Docker images are immutable and it is not possible to simply store persistent data within containers. When applications write to the Docker union file system, that data is lost as soon as the container is stopped. Docker provides a solution for persisting data, that allows administrator to mount a mount point existing on the container host (OpenShift node) within the container itself. It is similar to concept of raw device maps in virtual machines except with file systems.OpenShift v3 interfaces with Kubernetes and Kubernetes interfaces with Docker. As such we will mostly be referring to Kubernetes in this article. Kubernetes has a concept of pods which is a grouping of Docker containers that are co-existed. All Docker containers within a pod share same resources, including storage. OpenShift v3 supports using ephemeral storage for all database templates. As mentioned using ephemeral storage means application data is written to the Docker union file system. All data is lost, as soon as the Kubernetes pod and as such container is stopped. In addition, since using ephemeral storage uses the Docker union file system, writes will be slow. If performance is desired, it is recommend to use persistent storage. The use case for ephemeral storage is mainly around automated testing. You don’t need performance or to save data in order to test application functionality. OpenShift v3 supports using persistent storage through Kubernetes storage plugins. 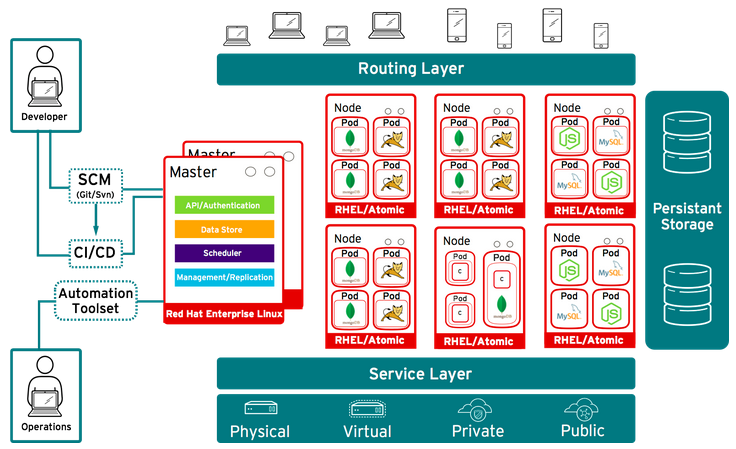 Red Hat has contributed plugins for NFS, ISCSI, Ceph RBD and GlusterFS to Kubernetes. OpenShift v3 supports NFS, ISCSI, Ceph RBD or GlusterFS for persistent storage. As mentioned, Kubernetes deploys Docker containers within a pod and as such, is responsible for storage configuration. Details about the implementation of persistent storage in Kubernetes can be found here. Kubernetes allows you to create a pool of persistent volumes. Each persistent volume is mapped to a external storage file system. When persistent storage is requested from a pod, Kubernetes will claim a persistent volume from the pool of available volumes. The Kubernetes scheduler decides where to deploy pod. External storage is mounted on that node and presented to all containers within pod. If persistent storage is no longer needed, it can be reclaimed and made available to other pods. OpenShift v3 makes this all seamless to the user and hides the underlying complexity, as we will see. Below is a snippet from the Docker configuration of a container using persistent storage. If you didn’t have OpenShift v3 and Kubernetes, you would have to deal with this for every single Docker container. In order to configure persistent storage, the storage must be available to all OpenShift v3 nodes using NFS, ISCSI, Ceph RDB or GlusterFS. In this example, we will configure an NFS server on the OpenShift v3 master. For a lab environment this is fine but for production environments you will want to use external storage for obvious reasons. The first step is to install NFS server and start the services. Once the services are running, we need to allow access through iptables. OpenShift v3 uses iptables and not firewalld. Allow SELinux policy for sVirt to write to nfs shares. By default the SELinux sVirt policy prevents containers from writing to NFS shares. On all nodes, we will want to install the nfs-utils so that nodes can mount NFS shares. In order to configure persistent volumes we need to create a JSON or YAML template file. In this example we will use JSON but Kubernetes supports both. We will also create a pool of 20 persistent volumes. From here all steps will be performed on the OpenShift v3 master. Create a JSON file that will be used as template for adding persistent volumes. Note: you need to replace the IP address with the IP of your OpenShift v3 master. In order to automate things we will create a for loop, that will create the NFS shares, set permissions and create persistent volumes in OpenShift v3. We can now list the persistent storage volumes in OpenShift v3. Notice we have no claims yet. Now that everything is configured, we can do a quick demo of how persistent storage in OpenShift v3 actually works. We will deploy a ruby hello world application from GitHub that uses a persistent MySQL database. First create a new project in OpenShift v3. This creates a namespace in Kubernetes. Next deploy our ruby hello world application from GitHub. This will deploy a pod that builds the code from GitHub and then using STI (Source To Image), will deploy a running pod with our built application. The reason for this is that we have different dependencies required for building and running applications. You are hopefully starting to see the power of OpenShift v3. If not stay tuned! Since we will want to access our application our service also needs to be exposed. OpenShift v3 will configure an HA proxy using router in openVswitch and an Apache vHost. Traffic is routed to the appropriate host based on the service name. The Apache vHost exposes the application based on the service name. Using vHosts allows OpenShift services to use the same ports and thus doesn’t require unique ports. Behind the scenes Kubernetes is handling the routing from the OpenShift v3 node to the Docker container. We can check OpenShift v3 UI or console to see the status of our build and deployment. Once complete we should have a builder pod that has exited with 0 and a running pod. If we open a web browser and point it at the service name we should see the application. In this case it won’t show us much since we don’t yet have a database. Lets add a persistent MySQL database and connect it to our ruby hello world application. A MySQL database will be deployed using persistent storage. Once the database is deployed the pod should be running and the we should also see a persistent storage volume claim. Once we have verified everything we should also be able to use our ruby hello world application. Lets do a put for a key/value pair. In order to demonstrate persistent storage, let us now delete the MySQL database pod. Don’t worry the replication controller will automatically deploy a new pod and of course our data will be saved. If we were using ephemeral storage the data would be lost at this step. Finally lets go back to our ruby hello world application and and do a get for our key “keith”. We should see the value is “tenzer” thus confirming persistent storage is working. In this article we have seen the power of OpenShift v3 in delivering a complete platform for building, deploying and running container-based applications. We have discussed the use cases behind ephemeral and persistent storage within OpenShift v3 ecosystem. Finally we have implemented and shown a compelling use case for persistent storage. OpenShift v3 is a platform for building and running next-gen applications using immutable container infrastructure. The goal is to deliver innovation faster. Hopefully this article has given you a glimpse at what is available today and inspired you to try things yourself. If you have any feedback or use cases for OpenShift v3, lets hear it! A special thanks goes to Wolfram Richter, a mentor and colleague who helped tremendously in creating the content for this article. “server”: “192.168.122.60” = is this the IP of your server? Yes this is the IP of the mgmt server. I have heard some things changed in OpenShift v3.1. I havent had a chance to test these steps on newer versions of OpenShift, I did this guide based on v3.0. I think the templates may have changed. I have seen this error, it means typically that the container node could not mount the NFS share. This is typically due to firewall rules. You can test by trying to manually mount one of the NFS shares used for persistent storage on compute nodes. Can we use Flexvolume plugin (which enables users to write their own drivers and add support for their volumes in Kubernetes) to provide persistent storage for OpenShift? Yep that should work, NetApp did thAt with trident project you can check it out on GitHub. Thanks for a quick reply. I will check that! If a storage requires or needs 2 GB and our PV is of 10gb ,Does that mean 8GB of space is wasted. If so, what should be the proper way to setup. I heard they overcome this situation in Openshift 3.5.
you are correct. Since NFS does not support dynamic provisioning the capacity will be wasted, OCP 3.5 does not change that. By “storage requires ” i mean claim coming from a POD. I can see all PV even PV is getting bound permissions are correct. Still the POD is failing for database. what is error from logs in pod? I deleted the app right now. Creating a new one. Please help with the syntax..
2018-11-09T16:55:10.272627Z 0 [Warning] TIMESTAMP with implicit DEFAULT value is deprecated. Please use –explicit_defaults_for_timestamp server option (see documentation for more details). 2018-11-09T16:55:10.391685Z 0 [Note] InnoDB: If the mysqld execution user is authorized, page cleaner thread priority can be changed. See the man page of setpriority(). 2018-11-09T16:55:10.720742Z 0 [Note] InnoDB: Highest supported file format is Barracuda. 2018-11-09T16:55:12.472811Z 0 [Note] InnoDB: File ‘./ibtmp1’ size is now 12 MB. 2018-11-09T16:55:12.476470Z 0 [Note] InnoDB: 96 redo rollback segment(s) found. 96 redo rollback segment(s) are active. 2018-11-09T16:55:12.476488Z 0 [Note] InnoDB: 32 non-redo rollback segment(s) are active. 2018-11-09T16:55:12.532430Z 0 [Note] Plugin ‘FEDERATED’ is disabled. 2018-11-09T16:55:12.532598Z 0 [ERROR] Can’t open the mysql.plugin table. Please run mysql_upgrade to create it. 2018-11-09T16:55:12.533186Z 0 [Warning] Gtid table is not ready to be used. Table ‘mysql.gtid_executed’ cannot be opened. 2018-11-09T16:55:12.535268Z 0 [Note] Found ca.pem, server-cert.pem and server-key.pem in data directory. Trying to enable SSL support using them. 2018-11-09T16:55:12.535286Z 0 [Note] Skipping generation of SSL certificates as certificate files are present in data directory. 2018-11-09T16:55:12.536363Z 0 [Warning] CA certificate ca.pem is self signed. 2018-11-09T16:55:12.536433Z 0 [Note] Skipping generation of RSA key pair as key files are present in data directory. 2018-11-09T16:55:12.706611Z 0 [Note] InnoDB: FTS optimize thread exiting.